Energy and Power Recently updated ! A man pushing a car along a level road is said to be doing work. The amount of work done depends on the force exerted and the distance through which the force acts. This unit is called the joule in honour of James Joule (1818—89) who did much early research in the area of work and the related of energy. Energy is the ability to do work. The amount of energy something has is the amount of work it can do. The unit of energy is the Joule. A bulb in a desk lamp can convert electrical energy into heat and light at the rate of 40 joules per second; a bulb in a floodlight can convert electrical energy into heat and light at the rate of 500 joules per second. The second bulb is more powerful than the first. A builder brings 1000 blocks each of mass 20 kg from the ground, up a ladder, to the top of a house. It takes him 5 hours to do so. A crane lifts all the blocks together from the ground to the top in a time of 10 seconds. Even though the man and the crane do the same work the crane does it in a much shorter time. The crane is much more powerful than the man. This unit is called the Watt (W) in honour of the English scientist James Watt. Since a body can do work for different reasons it can have energy for different reasons. It is useful to classify energy according to the reasons that bodies have it. KINETIC ENERGY: All moving objects have energy due to their motion. The energy a body has due to its motion is called kinetic energy. POTENTIAL ENERGY: Potential energy is the energy a body has due to its position in a force field. ELECTROMAGNETIC ENERGY: This is the energy transmitted from one point to another in the form of electromagnetic waves that travel at the speed of light. Example of a electromagnetic energy producer is a microwave. INTERNAL ENERGY or heat energy: The molecules of every substance, whether solid, liquid or gas are in perpetual motion. If heat is supplied to a substance, the motion (the vibration) of its molecules increases as its temperature rises. The kinetic energy of the molecules therefore increases. Thus heat is a form of energy. SOUND ENERGY: Any source of sound is always some object vibrating. As sound travels through a substance, the vibration from the source is passed on from molecule to molecule in that substance. Each molecule acquires energy in kinetic and potential form as the sound wave passes. CHEMICAL ENERGY: The energy given out (or sometimes taken in) in the form of heat, light or kinetic energy during a chemical reaction is called chemical energy. For example, when something is burned, some of the chemical energy stored in it is changed into heat and light energy. ELECTRICAL ENERGY When an electric current flows in a metal wire subatomic particles called electrons move in the wire. As they move, they lose energy called electric potential energy. This potential energy appears as heat and other forms of energy in the wire. Energy cannot be created or destroyed but can only be transferred from one body to another or changed from one form to another. In every chemical or physical reaction, there is no net gain or loss of energy; any loss is always accompanied by an equal gain. Every day we use energy for many purposes, e.g. transport and heating. The sources of this energy are many, e.g. oil, coal and hydroelectricity. Sources of energy are classified as renewable or non-renewable. Examples of renewable energy sources are wind energy and solar energy, hydroelectric energy, wave energy and biomass. Non-renewable sources include oil, coal, peat and natural gas. Energy is said to be renewable if the source of the energy is still there after energy is taken from it, and non-renewable if the source of the energy is gone after energy is taken from it. Renewable energy sources will not run out. A problem with renewable energy sources is generating enough reliable energy to meet all our requirements. A lot of research is being done to find practical ways of using these ‘altemative’ sources for the future. Non-renewable energy sources are fossil fuels, oil, gas, coal, peat or nuclear. They are usually easier to get energy from and store, but have a bigger environmental impact. We need electrical energy to run all our appliances at home. We know that energy is everywhere around us, but how can we get it? There are several ways to transform energy into electrical energy. Energy plants have all these components to produce energy. Let’s see a very simple one. The store water behind an enormous dam flows through the intake and into a pipe called a penstock. The intake remains closed when no energy is asked for, for example, at night, as everybody is in bed. The water pushes against blades (the arms of the rotary mechanism), causing them to turn. 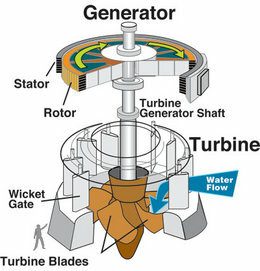 The turbine spins and its shaft is connected to a generator that changes the mechanical spinning energy into electrical energy ( electricity ). Advantage: Water power is reasonably easy to store ( in a reservoir ). Renewable energy. The electrical generator (Alternator) produces electricity with a voltage of about 20000 volts. It is not enough for transport. Let’s see why. If we want to transfer high power from the electric plant to the town where it can be used, we need high Voltage and Current ( Amps )values. Remember that Amps mean electrons moving through conductors which, because of their collisions with atoms, produce heat. The cables of transmission lines are made of aluminium ( cheaper ) or copper ( more expansive ) because they have a low resistance. So the higher the current, the higher the energy lost in the wires. It is not good. All this work just to warm the bird’s foot. By the way, do you know how birds can sit safely on electric power lines?. The answer is simple. Because the bird only touches one line, so electrons flow through the path of least resistance, the wire, and not its body. So, the trick is to reduce the Current and increase the voltage. There is an electrical device that does just this. Its name is the transformer. Electrical transformers are widely used to “transform” voltage from a lower voltage to a higher voltage or vice versa ( normally in appliances ). The principle of magnetic induction between coils makes it possible. 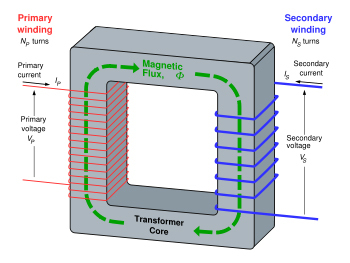 A transformer basically consists of a ferromagnetic core and two coils called “windings”. See the photo on the right. A changing current in the primary winding generates an alternating magnetic field in the ferromagnetic material. The alternating magnetic field “goes and comes back” through the magnetic core ( the green line ). There is a relationship between voltage and electric field, so if a voltage is applied in the primary winding with 10 turns it generates a Magnetic field of value X , the same magnetic field generates a voltage in the secondary winding. 20.000 X 100 = 20000 X N2 …..N2 = 2.000.000 / 20.000 = 1000 turns. As Power is a constant, the current in the secondary winding will be less. Now, everything is ready for the electricity to travels long distances to a substation. 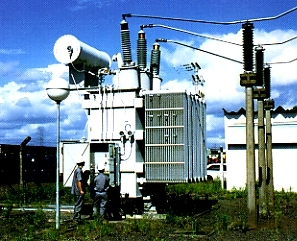 Substations are situated near factories and homes. Here transformers do their work in a inversely. I mean, they change the very high voltage electricity back into lower voltage electricity. In this case, the secondary winding will have less turns than the Primary Winding. The next image illustrates the different elements of a transmission power system. 1º Step, The power plant, in this case a Hydroelectric plant. floodlight: light that is a source of artificial illumination having a broad beam; used in photography. Crane: a device for lifting and moving heavy weights in suspension. Blade: the arm of a propeller or other similar rotary mechanism, such as an electric fan or turbine. Core: The piece of iron, or other ferrous material forming the central portion in an transformer .